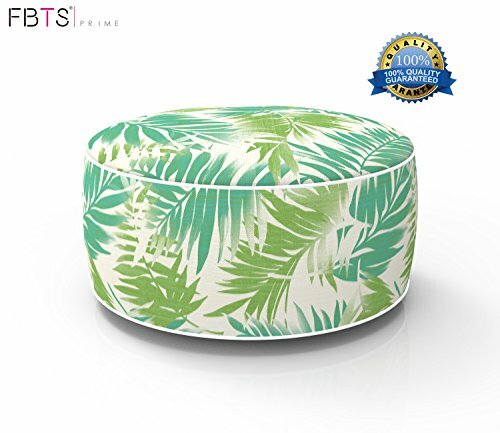 Do you want outdoor inflatable ottoman that light green leaf dia 21 inch x 9 inch height portable and suit for multiple occasions? ★PACKAGE INCLUDED - 1 x outdoor inflatable ottoman light green leaf + 1 x Filling (25u,Thick PVC explosion-proof liner). Gift-wrapping package with PVC handle bag. NOTE TO CUSTOMERS - The package does not include air pump, please purchase it by yourself. ★CUTE SHAPE & HEALTHY MATERIAL - Unique pattern offers house a lovely seat and decoration. FBTS Prime outdoor foot stools and ottomans external fabric uses spun polyester, removable, fade-resistant, mold-resistant and water-resistant, color fastness to sunlight 500 hours. Thick PVC explosion-proof liner durable and safe, no harm to your children.